In 1984 the California Energy Commission said "many institutional, engineering, environmental and economic issues must be resolved before the industry is secure and its growth can be assured." Though it was not clearly stated, the primary environmental issue alluded to was the extreme hazard that wind turbines posed to raptors. Since the early 1980s, the industry has known there is no way its propeller-style turbines could ever be safe for raptors. With exposed blade tips spinning in open space at speeds up to 200 mph, it was impossible. Wind developers also knew they would have a public relations nightmare if people ever learned how many eagles are actually being cut in half – or left with a smashed wing, to stumble around for days before dying. To hide this awful truth, strict wind farm operating guidelines were established – including high security, gag orders in leases and other agreements, and the prevention of accurate, meaningful mortality studies. For the industry this business plan has succeeded quite well in keeping a lid on the mortality problem. While the public has some understanding that birds are killed by wind turbines, it doesn't have a clue about the real mortality numbers. And the industry gets rewarded with subsidies, and immunity from endangered species and other wildlife laws. To fully grasp the wind turbine mortality problem, one needs to examine the 2004 report from the Altamont Pass Wind Resource Area (APWRA). The study lasted five years (1998-2003), and researchers did not have full access to all the Altamont turbines. This careful, honest effort analyzed turbine characteristics in relation to mortality and estimated mortality from body counts compiled in careful searches. Researchers then adjusted mortality numbers by examining statistical data based on searcher efficiency and other factors, such as carcass removal by predators and scavengers. The report even suggested that the mortality estimates probably erred on the low side, due to missed carcasses and other human errors. This study stands in marked contrast to studies being conducted today, especially the Wildlife Reporting Response System that is currently the only analysis happening or permitted at most wind farms. The WRRS is the power companies' own fatality reporting system, and allows paid personnel to collect and count carcasses. It explains why mortality numbers are always on the low side and why many high-profile species are disappearing near turbine installations. Incredibly, the APWRA report actually admitted: "We found one raptor carcass buried under rocks and another stuffed in a ground squirrel burrow. One operator neglected to inform us when a golden eagle was removed as part of the WRRS. Based on these experiences, it is possible that we missed other carcasses that were removed." (Chap. 3, pg. 52) It's easy to see how human "errors" keep bird mortality low. The APWRA study also documented that raptor food sources, turbine sizes and turbine placement all directly affect raptor mortality. It was thus able to identify many of the most dangerous turbines or groups of turbines – those with a history of killing golden eagles, kestrels, burrowing owls and red-tailed hawks. The study also discussed how higher raptor mortality occurred when smaller towers were "upgraded" with larger turbines and proportionally longer blades. These wind turbines offered what raptors perceived as intermediate to very big windows of opportunity to fly through what looked like open spaces between towers, but were actually within the space occupied by much longer, rapidly moving rotor blades. The result was significantly more fatalities of golden eagles, red-tailed hawks, American kestrels, burrowing owls, mallards, horned larks and western meadowlarks. Turbines with slower rotations per minute actually made it appear that there was more space and "greater windows of time." This fooled birds, by giving them the illusion that they had open flight space between the rotating blades. In fact, the illusion fools people, too. The newest turbines move their blades at 10-20 rotations per minute, which appears to be slow – but for their blade tips this translates into 100-200 mph! All this was very important, because the industry was moving away from smaller turbines and installing much larger turbines, with much longer blades. However, the industry not only ignored the APWRA findings and rapidly installed thousands of these much larger turbines across America, despite their far greater dangers for birds and raptors. It also kept the AP WRA out of the public's awareness, and focused attention on new study results that reflected far less accurate (and honest) searches and surveys. 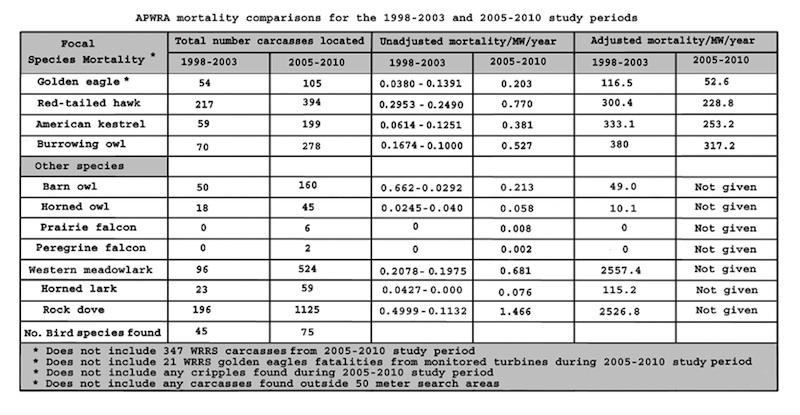 The APWRA report also looked at the placement of carcasses in relation to turbine types. It documented that the distances carcasses were found from turbine towers increased significantly as turbine megawatt ratings and blade lengths increased. Based on sample of about 800 carcasses, the report revealed that birds were found an average of 94 feet (28.5) meters from 100Kw turbines on towers 81 feet (24.6 meters) high. Obviously, taller turbines with longer blades and faster blade tip speeds will catapult stricken birds much further. Figure 1 shows how a turbine 2.5 times larger will result in an average carcass distance of 372 feet (113.5 meters) from the tower. The wind industry is acutely aware of this. 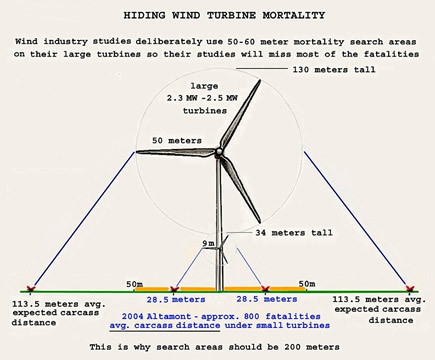 Recent mortality studies like those conducted at the Wolfe Island wind project (2.3 MW turbines) and Criterion project in Maryland (2.5 MW turbines) should have used searches 655 feet (200 meters) from turbines, just to find the bulk (75-85%) of the fatalities. Of course, they did not do so. Instead, they restricted their searches to 165 feet – ensuring that they missed most raptor carcasses, and could issue statements claiming that their turbines were having minimal or "acceptable" effects on bird populations. Exclude certain carcasses. The 2005-2010 WRRS data show that 347 carcasses (primarily raptors) – plus 21 golden eagle carcasses – were excluded from mortality estimates, because industry personnel claimed they were found outside standard search procedures, said the "cause of death was unknown" (even when the birds' heads had been sliced off), or removed carcasses ahead of a scheduled search. Exclude mortally wounded or crippled birds found during searches, even if they display turbine-related injuries. Even though many birds hit by turbine blades die within days, if they are still breathing when found, they are considered mobile – and thus not fatalities. Simply avoid searching near some of the most dangerous and lethal turbines. The industry justifies this exclusion by claiming that "the number of turbines monitored was reduced and spatially balanced for a randomized rolling panel design." That this "reduction and balancing" excluded the most deadly portion of the Altamont facility was presented as coincidental or part of a proper scientific methodology. The cold reality is that honest, scientific, accurate mortality studies in the Altamont Pass area would result in death tolls that would shock Americans. They would also raise serious questions about wind turbines throughout the United States, especially in major bird habitats like Oregon's Shepherds Flat wind facility and the whooping cranes' migratory corridor from Alberta, Canada to Texas. The techniques discussed here help ensure that "monitoring" studies match the facility operators' desired conclusions, and mortality figures are kept at "acceptable" levels. Meanwhile, assorted "experts" continue to insist that the greatest threats to golden eagles are other factors like hikers getting too close to their nests, even when most abandoned nests in Southern California are nowhere near any hiking trails and wind turbines continue to slaughter eagles. It is essential that people realize that no energy source comes anywhere close to killing as many raptors as wind energy does. No other energy companies are allowed to pick up bodies of rare and protected species from around their production sites on a day-to-day basis, year-in and year-out. No other energy producer has a several thousand mile mortality foot print (the highly endangered whooping cranes' migratory corridor), like what wind energy has. America's wildlife, and proper application of our environmental laws, require nothing less.